Residents who visited the communications center Wednesday remarked on the technology and skill that goes into dispatching. FARMINGTON — Curious residents got a chance to see what an emergency dispatch center looks like and to look at the recently completed call center Wednesday at the center’s open house. “This is an accomplishment of the community to have this built,” Farmington resident Karyl Condit said after getting a tour of the building. The new $600,000 Franklin County Regional Communications Center opened this spring, but not before its cost first was debated by county officials and residents and passed in 2012 by a close, 2,062-2,035 vote. The 2,200-square-foot building, completed last April, houses a communications department that was separated from the sheriff’s department recently and made into its own entity, reporting directly to the county commissioners. The department includes a director, two supervisors and nine dispatchers. Stan Wheeler, director of the communications center, said the tours provided an opportunity for residents to learn the mechanics of how a 911 call is handled. He told visitors Wednesday that callers don’t always realize there are two dispatchers working on their emergency, and they often are alarmed when one disptacher is giving first-aid instructions in a medical emergency and not calling for first responders. “However, while one dispatcher is taking the call, a second dispatcher is listening to the call and dispatching an ambulance to the scene,” he said. 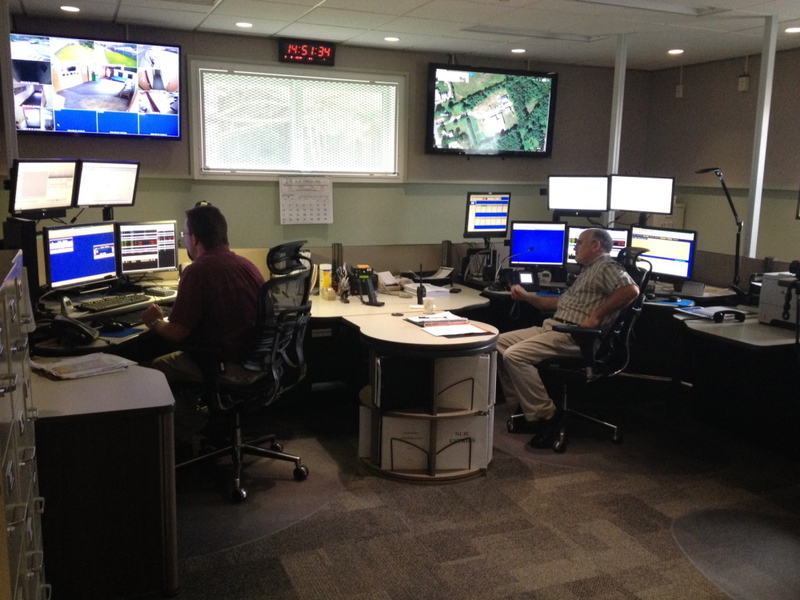 As Wheeler walked visitors through the center, he noted that in Franklin County, just two dispatchers are on duty handling all the calls that come in for any one emergency. As an example, he described a crash on Wilton Road that might result in the driver, a passenger and multiple third parties in passing cars calling for help while the police and fire services also are looking for information from the dispatchers. “It’s not unusual to get eight or 10 911 calls for some car crashes,” he said. He said the dispatchers work together to rule out duplicate reports of the same crash and at the same time communicate with police and firefighters asking questions while heading to the scene. “And then sometimes another emergency call comes in while they are still working on the first one,” he said. This year the dispatch center has taken 37,000 calls so far, said Wheeler. Visitor Roger Condit said it was the first time he saw firsthand how much technology and work goes into running a communications center. “I had no sense of the expanse of what they do. It’s impressive,” he said, pointing out the six screens at each dispatcher station. To demonstrate, Wheeler pulled up a location on Google Maps on one of the larger overhead display screens. Wheeler said if a deputy or ambulance can’t find a particular location, they can use the maps to better describe what they need to be looking for. “In this case, we can say it’s a red house,” Wheeler said, pointing to his home on the screen.